Racing the storm at the Botanical Gardens. Baking blueberry muffins from scratch. Rooftop times at Taylor's People's Park — and this salad! Twirling dreams at the Bristol Renaissance Faire. Enjoying happy hour at the Harbor House. Eatings lots of greens in our sweltering apartment. Celebrating Joel's birthday at The Yard. Hiking the Scuppernong Nature Trail. Small plates and a beautiful patio at La Merenda. Lunching at Vanguard and discovering my new favorite burger. Fried chicken & biscuits with friends at Palomino. When I hear the words "Iron Horse Hotel," two things come to mind: Harley Davidson and expensive. I know that the Iron Horse boasts some great restaurants, but they seemed out of reach to me, price-wise. Well thanks to google and a search for outdoor dining in Milwaukee, my eyes were finally opened to The Yard. The Yard is the Iron Horse Hotel's gorgeous patio, serving drinks and upscale bar food. You don't have to be all dressed up to enjoy a beer at The Yard, but the ambiance will leave you feeling like a schmuck if you're too cazh. While the prices are certainly more within reach and the food is more laid-back than at the Iron Horse's swanky Smyth restaurant, it still feels like a special occasion place. On this our first trip to The Yard, we went because of our dear friend Joel, who's celebrating his golden birthday this weekend. Happy Birthday Joel! Our criteria for the night was that we go someplace new (at least, new to us!) and outdoors. The Yard was Joel's smart pick. To start, we ordered beer and Clock Shadow Creamery cheese curds — curds so fresh, they're made right down the road and are still squeaky. They'll set you back $12, which sounds like a lot because it kind of is. However, they are divine: battered to perfection, served with ranch and spicy dipping sauces, and (like I said) the cheese is super fresh. I know I'll be dreaming about these cheese curds. For dinner, I went for the turkey club with bacon, avocado, and tarragon mascarpone on crusty Rocket Baby bread. I could tell this was one substantial and high-end turkey club — I mean, look at all that meat! But it was way too much turkey for my taste. About half of that had to go before I'd even attempt it. So that said, I wouldn't get it again. The fries, however, were perfection. The boys in our group went for the Branded Burger: a house-blend patty of bison and bacon topped with Hook's havarti cheese, avocado spread, and arugula on a ciabatta bun. I had one bite of Adam's and oh boy, was it ever tasty! This is a burger that's worth the $15 price tag, and if I make it back to The Yard, that's what I'm getting. Another way you know The Yard is fine dining with a casual twist: Our lovely waitress Alise learned our names. That was a first for all of us. She'd come over and address us personally, making easy-breezy small talk throughout the evening and triple checking that there wasn't anything lacking from our experience. It was some of the best, most attentive service I've ever encountered. We were all pretty taken aback by it. Is this how the other half lives? One final note: If you're not wanting to drop a bunch of money on fancy bar food, you don't have to. There's a sea of roomy couches throughout The Yard where you can kick back with a beer – and maybe an order of cheese curds (trust me people!). The place wasn't crowded when we went (granted it was Tuesday), and I imagine you could spend hours lounging around, enjoying the scene. The Yard is open until 2am on Friday and Saturday nights and serves food until midnight. Though I went to high school in Waukesha and my parents now live there, I still get lost in the maze of streets. Thank heavens for GPS, or I'd never remember the best route to Main Street, which is where you'll find the the small town cute-ness of Waukesha and Taylor's People's Park, our favorite spot to dine. The interior of the restaurant is bustling and fun — definitely recommended. 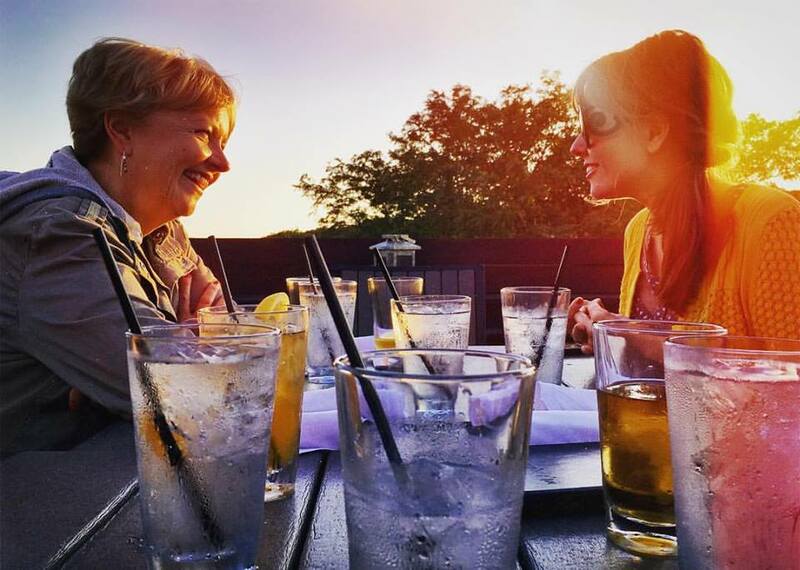 But if you have a warm summer night, be sure to brave the hour-long wait and snag a table on the roof. It's so wonderful! The bar area, with its colorful string lights and lanterns, gives off a festive feel, and the summery open air ambiance can't be beat. We went on a Friday night, when downtown Waukesha hosts Friday Night Live. There's live music and local shops are open late — it's the perfect way to kill time while you're waiting for your table on the roof. My family and I actually waited almost two hours, but didn't mind as we browsed Main Street's galleries and antique shops. These shops won't blow your mind or make your Top 10 list, but it's enough to entertain while you work up an appetite. For dinner, since it was Friday, most of the people in our little party ordered the fish fry. Strangely I wasn't one of them — what alternate universe is this?! But my mom was kind enough to share some of hers with me, and it gets my stamp of approval. I would order that super-delicious fish fry for myself in a heartbeat! But that night I went for the Frankie's Garden salad with romaine, cucumber, walnuts, goat cheese, dried cranberries, and avocado, all topped with grilled salmon. Absolutely delicious! I love that People's Park offers healthy options for their sandwiches too. You can get fries on the side of course, or sub a fresh cucumber, tomato, onion, mozzarella, and olive salad at no extra charge. No extra charge for healthy? What a concept! Wish we saw more of that. Not that it would stop me from ordering fries, but you know. I hadn't been to the Boerner Botanical Gardens since I was a kid. Before my yearly dance recital, my family would go there to snap some pics of me in all my bun-and-stage-makeup glory. Oh boy! So I was super excited to go back to the gardens last Thursday and see what I'd been missing all these years since I quit dancing (on a stage, that is). Sadly we were mostly rained out, but more on that later. The Garden's weekly concerts are Thursdays this summer from 6:30 to 8:30, but you can get in as early as 6:00 for free (here's more info). Any other time, admission is $5.50 for adults, though the gardens are offering free days the first Tuesday of the month through September. During the concerts, food and beverages are available for purchase, or you can bring your own picnic. I recommend BYO. I didn't see what the food options were, but it certainly wasn't a wide array like at other summer concert series in the area. My friends and I enjoyed a spread complete with wine and a necessary monogrammed mini cheeseboard my friend Erin got as a wedding gift last September. A bluegrass band started promptly at 6:30, but only played for a few minutes before the lead singer said "Don't look behind you folks!" Behind us was a big bad summer storm. The threatening clouds rolled in quickly, as most folks in the crowd packed up their things and made a beeline for the parking lot — all to the sounds of that bluegrass banjo. Is there a better soundtrack for a bunch of people scurrying like crazy to get out of a looming storm? I'd love to go back for another concert at the gardens, but we'll see if time allows this year. Concerts run through September 1st. If you'd like a different excuse to check out Boerner, there's always their Sunday brunch buffet. For more info on the many happenings at the Boerner Botanical Gardens, visit their website! I'm crazy-picky about bananas. If they're an hour past slightly-green, I won't eat them. So having leftover overripe bananas is a pretty common occurrence at my house. If I feel like being healthy, I'll whip up banana, oat, and nut butter cookies (so good!). If I have Biscoff cookies in the pantry, this banana bread is to die for. Or if I've stocked up on bran, banana bran muffins are a good option, too. But I'd yet to find a plain ol' go-to banana muffin. Until today! These muffins came by way of Allrecipes. I doctored up the original recipe based on some of the comments (adding vanilla, cinnamon, nutmeg, and some mix-ins). I also topped each muffin with a sprinkling of turbino sugar — a trick I learned from making blueberry muffins a few weeks back. The sugar crystals caramelize beautifully in the oven for a muffin top with a sweet crunch. 1. Preheat oven to 350 degrees. Spray a 12-cup muffin pan with nonstick spray, or place muffin liners in each cup. 2. In a medium bowl, sift together flour, baking powder, baking soda, salt, cinnamon, and nutmeg. Set aside. 3. In a larger bowl, use a fork to mix together mashed bananas/applesauce, sugar, egg, melted butter, and vanilla. 4. Add the dry ingredients to the wet, using a rubber spatula or large spoon to gently fold together, scraping the bottom and sides of the bowl. Mix until the flour is just combined, adding any desired mix-ins at the very end. 5. Divide batter evenly between the 12 muffin cups (I used a 1/4 cup measure to scoop the batter into the cups). Top each with a sprinkling of turbino sugar. Bake for 23 to 30 minutes, or until golden on top and a tester inserted in the center of a muffin comes out clean. Let rest in the pan for 5 to 10 minutes, then transfer to a wire rack to cool completely. Notice I mentioned applesauce, and here's why: I only had two ripe bananas on hand, but the recipe called for three. When that happens, you can sub 1/2 cup applesauce (I'd use plain or cinnamon — we had plain in the pantry this time) for one banana. Of course the flavor won't be as banana-y, but it's better than no muffins at all! Also notice that you want to mix the batter until the flour is just combined with the wet ingredients, and don't use an electric mixer. That's because muffin batter doesn't have as much liquid, compared to other cake-y sweets. Using a mixer would form too much gluten and make the muffins tough. Folding gently is the way to go for a soft, tender morsel. And isn't that all we want in life? When Adam said that La Merenda is the one place in Milwaukee where the food is consistently like a religious experience, I laughed. Then I realized the man is right. We don’t eat at La Merenda often, but there’s always something (if not everything) that leaves me uttering unintelligible yummy sounds as I do my best to inconspicuously use my fork to lick the plate. Mix in a summer sunset and charming patio dotted with wildflowers and it really is a slice of heaven. I’d actually never sat on the patio before. It was a Monday night, and Adam and I were seated at a communal table. Sounds like an invasion of privacy just waiting to happen, given the not-too-big size of this particular communal table, but no one else was seated with us. Having the whole table to ourselves was very nice, but it really would have been fine either way. So if they only offer you a communal table, go for it. It’s so worth it to be outside. La Merenda serves small plates, so Adam and I ordered four plates between the two of us. The menu changes, so don’t set your heart on something like the Gnocchi del Giardino — it wasn’t on the menu. But it’s still fun to check out their menu online to get some ideas. Our first plate was the Potato Pierogies: potato-stuffed dumplings with cheese, sage brown butter, and roasted pecans. This one had me dying to lick the plate. Sage and brown butter. Mmm. Our second plate was the Market Fish Curry: white fish in a coconut curry sauce with broccoli, potatoes, Thai basil oil, and tomatoes. So scrumptious! Also plate-licking good. Even after we’d finished all the fish and veggies, I kept going back for the sauce with my fork. To which Adam made a “Really?” face. To which I responded “Hey, we’re paying for it.” Score one point for me. Next was part other-worldly delicious, part tastes-like-potpourri. I’d read on yelp, from multiple reviewers, that the Argentinian Style Beef was like an out-of-body experience. So naturally we ordered it. The beef itself was divine. Savor every bite. Then try the mashed sweet plantains that accompany that glorious meat. You’ll be confused. Should I like this? Everything else has been amazing, surely there’s something wrong with me if I’m not digging these plantains. Maybe I should try one more forkful. Why does it taste like flowers? There must be some mistake. No friends, there is no mistake — the mashed sweet plantains tasted like soap and I don’t know why. It’s tragic, because that beef — oh that beef! Luckily we washed down that flowery mash of plantains with Pork Belly Confit Crepes. Being a crazy person when it comes to fatty meats, I’m always wary of pork belly. But if you’re a normal person when it comes to meats, just order this crepe plate — it’s a one-way ticket to heaven. Even for me it was heaven. Tucked inside the crepe, along with the meat, you’ll find mushrooms and white truffle cream sauce. Say it with me: white truffle cream sauce. Hello lover. Overall, I loved doing dinner-for-two at La Merenda. Adam and I each enjoyed a satisfying amount of each plate (two whole pierogies! ), though obviously dining with a larger group would allow you to have just-a-taste of lots more things. It’s a win-win really. The key is dining at La Merenda either way. Hallelujah! Last year I dished on 8 tips for the Bristol Renaissance Faire. Last weekend I was happy to go back to see what 2016 had in store. Well I have a few take-aways and a couple questions. If you have the answers to said questions, please comment below. I must have answers. Take-away #1: Three hours is not enough time at the Renaissance Faire. The joust alone will set you back at least an hour. The grounds are sprawling and there are so many shops to peep, games to play, and food to stuff in your face. I say you need at least five hours. Take-away #2: The gelato is damn good. We got chocolate with a pillow of whipped cream on top. The cream was from a can, but the gelato itself was super rich and cocoa-y. Big fan. Even though I really did want ice cream in a waffle cone (which is apparently just up the road from the gelato, if you're heading away from the joust). Take-away #3: If I am ever unemployed, I'm going to apply to be a skirt-twirling dancer at the Renaissance Faire on summer weekends. And in case you're wondering, I would work in the Kate Spade store during the week (mall air conditioning and discounts!) and be a flight attendant during the fall, winter, and spring months (free flights!). That, or open a card & cake shop. Solid plan, right? Take-away #4: At the very end of the Faire day, the entire cast of players parades out of the main gates and sings a jolly song. Then the Queen says some parting words to the crowd, everyone cheers, and it's really just the best thing. So if you're staying until almost-the-end anyway, stay for the song. It will make your heart happy. Question #1: Has anyone visited a tarot reader or psychic at the Renaissance Faire? If so, how was it? I ran out of time, even though I had wanted to try it this year. Any feedback would be appreciated. Question #2: Does the green knight win every time? Last year Don Vincenzo, the dark & handsome Italian in green, won the joust. He won again this year. By chance or by design?? I ASK YOU. They appear to keep score, but is it all an elaborate ruse?! Dying to know. Mmm Barolotta restaurants: Where Milwaukeeans go for really special occasions. I'll never forget that divine ravioli at Ristorante Bartolotta in Tosa, and Lake Park Bistro is magic when you're not the one footing the bill. Maybe someday I'll be able to dine at these posh spots on the regular, but today is not that day. Today is a day for affordable happy hours and live music on the Harbor House patio! I'd never been to the Harbor House before, and I must say it's just as lovely as any other Bartolotta restaurant. It's situated on the very edge of Lake Michigan, near Discovery World. There's a parking lot, but it's valet only, so look for a spot on the street. You can enter the patio from outside or through the restaurant, but you'll have to see the host if you plan on snagging a table. The happy hour prices are pretty great. $5 glasses of wine and $4 beers anyone? And there are some nice appetizer selections too, especially if mussels, oysters, and clams are your thing (don't worry, there are garlic parmesan fries too!). My advice: Don't take up space at a table if you're not going to order some food. Adam and I rather inadvertently did just that and felt kinda awful about it. We may or may not have tipped 100%. But there's a bar where you can sit and enjoy a drink without screwing the waitstaff out of their well-deserved big tips — noted for next time! On the menu, you might also find a more casual (read: more affordable) selection of sandwiches. A cheeseburger will set you back just $13.50, but you might want to call ahead to see if they serve these sandwich options all evening long. I'm not sure if they're only available for lunch and/or on the patio. Given the swanky yacht club vibe of the Harbor House, I wouldn't be surprised if you could only order entrées (like $51 twin lobster tails — !) during indoor dinner hours. If you're lucky enough to have a beautiful night, going for the patio music is very worthwhile. You can find the whole lineup of Sunday and Monday musical artists here. When we went, the patio wasn't overcrowded at all, and those who were in attendance were certainly on their best behavior. It's a lovely experience, perfect for date night or girls night. Sipping house wine and looking back at the Milwaukee skyline from the water's edge, it's like a little vacation from the rest of the city — and one I'd happily take again. If I had to pick a favorite fruit for desserts, I'd almost always pick lemon. Lemon bars, lemon cake, lemon cookies — get in mah belly! But blueberries run a close second. They're so sweet and beautifully rich in color, and a little lemon really brings them to life. Well when I was looking for a blueberry crumble recipe, I found this one from Allrecipes.com by way of Smitten Kitchen. It calls for the blueberries to mix and mingle with lemon juice and zest, so I knew it was a must try. The flavor is wonderful. The lemon peeks through subtly. The crumble is sweet & buttery. Talk about delicious! 1. Preheat oven to 375 degrees. Grease a 9 by 13-inch pan. 2. In a medium bowl, combine 1 cup sugar, flour, and baking powder. Mix in salt and lemon zest. Use a fork, pastry cutter, or your own two hands to blend the butter and egg into the mixture. The dough will be crumbly. Press half the dough into the prepared pan. 3. In a separate bowl, stir together 1/2 cup sugar, cornstarch, and lemon juice. Gently mix in the blueberries. Sprinkle the blueberry mixture evenly over the crust. Sprinkle with cinnamon. Crumble remaining dough over the berry layer. Sprinkle with cinnamon. 4. Bake for 30 to 45 minutes or until the top is slightly brown. Cool completely, then cut into squares. When I made these bars, I tried it with half white sugar, half brown sugar. The bars were perfect the first day out of the oven, but the crumble got rather soft by day two. I wonder if doing all white sugar as the original recipe suggests would make for a more crumbly crumble? I'll have to try it next time and see. Or if you're an expert on crumble toppings that stay crisp & crumbly, please comment below! Crumbly or softened, the flavor was great with the mixed sugars, especially when sprinkled with cinnamon. If the bars do get soft on day two or three, you could always warm them in the microwave for 15 seconds and top with vanilla ice cream. Don't mind if I do! Broadway fans, listen to this! Waitress the movie came out in 2007. I remember wanting to see it, but never did. Cue spring 2016 when Waitress the musical debuted on Broadway. 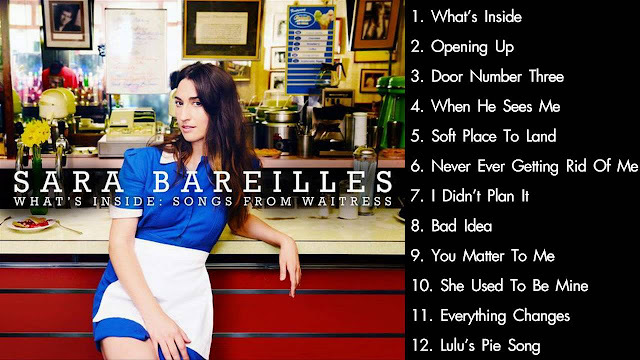 The score is written by Sara Bareilles, and I was surprised how much I loved it. I admit her songs like "Brave" and "Love Song" are powerful and fun — but a touch too pop-y and like something from a commercial for womens products for me to listen to on a loop. Well shut my mouth, I listened to her Waitress demo on repeat for two weeks straight. It was what finally lured me away from my beloved Hamilton, to be honest. I think that Sara's melodies are super catchy across the board, and her pop-y, romantic, kinda-Hallmark-card lyrics (I mean that in the best way) work perfectly for a musical. Not to belittle the lyrics — I love them and there are plenty of beautiful, subtle moments. But I think what fueled my obsession were the melodies and Sara's insanely beautiful vocals demo-ing the songs. Now there's an original cast recording, too, starring Tony-winner Jessie Mueller as Jenna. Here's a brief synopsis: Jenna is a young woman, unhappily married to a shmuck, who works in a diner and also happens to be a phenomenal baker of pies. We find out very quickly that Jenna is pregnant, and she goes on to have an affair with her also-married baby doctor. We watch Jenna find her footing, along with her two best friends and fellow waitresses. It's not really giving anything away to say there's a happy ending, and I like that. The Waitress musical follows the movie, which I finally saw after becoming obsessed with the demo album. I ordered the movie on Amazon for like $8. It was pretty great. Keri Russell is charming as always, and Nathan Fillion is everything. Boy do I love that man. He takes a corny line like "I could find the whole meaning of life in those sad eyes" and makes your heart burst in the most sincere way. I love that Sara worked that same line into one of the show's sweetest songs, "You Matter to Me." It's such a simple truth — that what we all really need at the end of the day is to know that we matter to someone. Sappy alert! 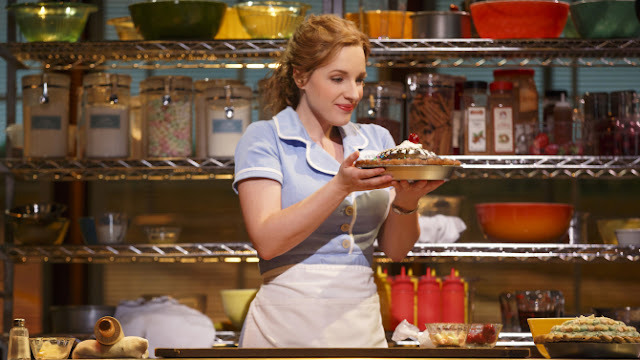 But really, Waitress is so much more than sap. It's funny, empowering, sweet, and sentimental. Of course I've only listened to the music, so I can't speak to the production as a whole. But if you're searching for a new musical to fall for, give Waitress a shot. And if you've got a new Broadway obsession of your own that I should check out, please share in the comments! Friends don't let friends not know about amazing Broadway musicals. Vanguard is a Milwaukeean's dream. The Bay View eatery boasts spirits and sausages — like, almost exclusively sausages. There are classics like brats and hot dogs, plus vegan sausages too. When they start styling the sausages by city, that's when things get really exciting. Try styling your sausage like Milwaukee (a brat topped with cheese curds, cheddar cheese, and cheese whiz), Chicago (tomato, pickle, celery salt, relish, peppers), or Tijuana (sour cream, salsa, jalapeño, cheddar). That's just the tip of the iceberg. Then there are the fancy sausages. Like the Duck BLT: duck sausage with bacon and sun-dried tomatoes topped with shredded lettuce, hollandaise aioli, and more bacon. Or the Thai Breaker: pork, lemongrass, ginger, and cilantro sausage topped with peanut sauce, carrots, and lettuce. I could go on, but we'd be here all day. Check out the menu and drool for yourself. Now it's confession time. I have to admit that sausages don't set my world on fire. Milwaukeean fail! I really have to be in the mood for a brat, and that brat has to be hot off the grill, ideally at Miller Park. I just won't go out of my way for one. And like I said before — Vanguard offers almost exclusively sausage sammys. What's a girl to do? Luckily there's a menu section called "Tube-less." That's where you'll find Thee Dirty Burger (interior shot pictured up top). It's a ground sausage burger, yes, but I'm cool with that. This burger is insanely delicious. Like, my mouth is watering just thinking about it. It comes with bacon, lettuce, onion, tomato, pickles, a special sauce, and Velveeta (I subbed cheddar). There are also scrumptious tubeless sides, like poutine (so good!) and fried cheese curds — on par with some of the best I've ever had. The point is, whether sausage sammys are your thing or not, go to Vanguard. Sit on the patio on a beautiful summer day. Share cheese curds and poutine with friends. Drink a beer. Eat hearty. You really will love every minute of it — this place is just so Milwaukee. I go through phases with salads. Last summer I was big on pears with dried cranberries, nuts, and goat cheese. This summer I'm all about berries, avocado, and — well — still goat cheese. Goat cheese makes the salad world go 'round. Maybe this one doesn't seem revolutionary, but as my mom likes to point out "This would be a $12 restaurant salad!" She's right. And it's so easy. It's all in the mix! If desired, add a little salt and pepper to enhance the flavors. A few things of note: Butter lettuce is giving me life right now. Try it, you'll love it. As for the cheese, most American-made fetas are actually made from cow's milk. The flavor and texture are totally different! Get yourself some authentic goat cheese. If you can't find it crumbled, buy the log form and crumble it yourself. Lastly I have to thank my friend Shea for introducing me to Brianna's dressing. I'd always seen it but never tried it — now I'm a huge fan. The french vinaigrette is great for this salad, as is the champagne caper. On July 4th, some friends and I had a nature and beach day in the Dousman region of Kettle Moraine State Park. As it's a state park, you need a super-official Wisconsin state park pass on your car's windshield to get in. Given the cost of a single day vs. the annual pass, I say get the annual and see more Wisconsin parks! But back to Kettle Moraine and the Scuppernong trail. There are various lengths of hikes you can take, from 2 miles up to 5+ miles. Since we had other things to do on the 4th of July (read: sit at the beach), my friends and I opted for the 2-mile hike. It's certainly hilly and the path itself might be gravel one minute and covered in red-orange pine needles the next. It's very pretty with all the lush greenery of high summer, and I can only imagine how lovely this walk would be in the fall as the colors change. During our hike, we went out of our way for the scenic overlook, but it all the leafy-ness got in the way of the view. Better luck next time! Walking the Scuppernong trail really made me thirsty to walk other Wisconsin trails. 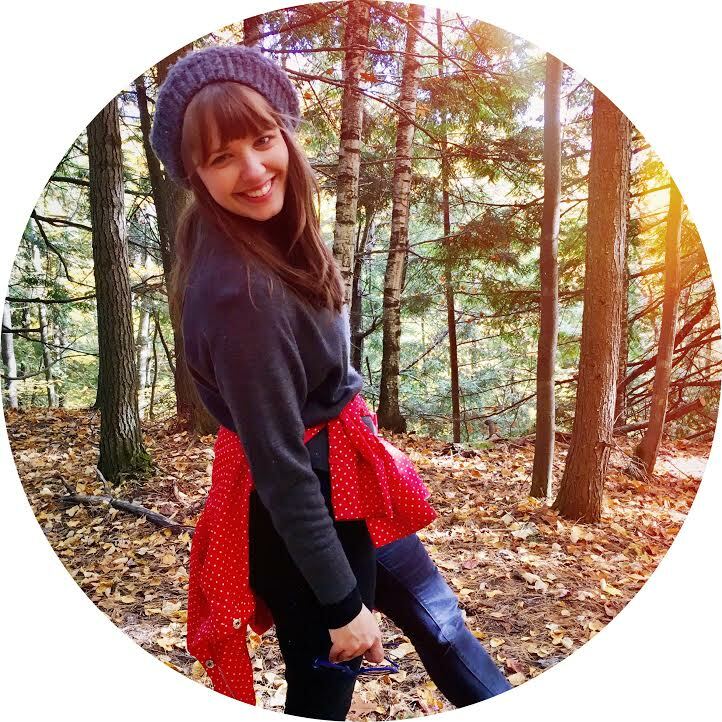 There are so many just a short drive from Milwaukee, and I always love walking the woods up north — why not walk them a little closer to home? They're certainly no less scenic. Have you ever cruised the Milwaukee River on a boat? I've been on a rented pontoon boat, and also a larger party boat. On that particular occasion, the vibe was this: inside was for clubbing, outside was for sightseeing. Our group stayed outside, though we were momentarily lured in by the promise of a free nacho bar. Sadly all it took was one friend saying "How long do you think that sour cream's been sitting out?" for us all to scurry back to the deck sans nachos. But enough about questionable nacho bars! This past weekend I went to see Soul Low on the high seas (Milwaukee River) through Milwaukee Boat Line's Concert Cruises. My coworker is friends with the band, so you know. VIP experience. Not. It really was a good time though! You can purchase tickets for the concert cruises in advance for a slightly reduced price, or wing it and get your tickets at the dock. One free drink is included in the $23 ticket cost — in our case, it was a choice of margarita or sangria. If you're planning to drive later, like I did, know that if you want to switch to water it's gonna cost you. "We only have bottled water," the bartender said with a slightly patronizing frown. I'm so sure. Granted it wasn't pricey, just ruffled my feathers at the time. But luckily the band cured any feather-ruffling. Soul Low was really great! I will warn you, however, to do your research before boarding a concert cruise. You don't want to be stuck on a boat with some band playing a genre of music you hate because there is literally no escaping it, unless you want to swim to shore. My favorite thing about the cruise though — not unlike my first Milwaukee River cruise experience — was playing the tourist. Ooh-ing and aah-ing over the lights of Rock Bottom Brewery, the ferris wheel at Summerfest, and our rather non-existent Milwaukee skyline. We glided past hoity-toity Third Ward condos, then floated father south where massive industrial ships and structures loomed in the darkness. Seeing all sides of Milwaukee from the water really was amazing — a worthwhile trip for even long-standing Brew City natives.